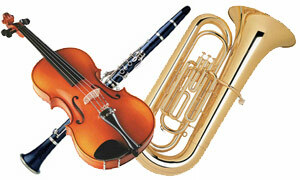 NJAOM is pleased to offer convenient instrument rentals for easy, fast pick-up at our academy in Basking Ridge. Our instrument rentals are sourced through our partnership with the highly trusted and reliable rental organization, K&S Music, with over 4 decades of high-quality instrument rental experience. All instruments are rented through NJAOM. We offer continued support from instrument sizing to maintenance. NJAOM is conveniently located in the heart of Basking Ridge and is one of the top music academies for young musicians in the region. NJAOM offers a variety of programs for students of all ages and abilities. Click below to learn more about AIM (Accelerated Introductory Music) GROUP CLASSES, world-class PRIVATE INSTRUCTION with our internationally renowned faculty for beginners through career-oriented young musicians, and our popular PRE-STUDIO CLASSES for our youngest learners, ages 3-6, with instrument introductions and opportunities to try out a variety of real instruments, appropriately sized! We offer TWO options for rentals. Both come with a free music book. We make instrument orders easy and efficient. Orders can be picked up at our academy in Basking Ridge on a weekly basis. Click below to place your order online and reserve your instrument today! Please have your rental code available when ordering. Ordering for school? Please email us with the name of your school for a discount code before ordering! Additional fun music goodies have been known to make their way into our customers’ orders free of charge. Enjoy! We are delighted to serve as a music resource for the local communities. In addition to carrying instrument supplies (strings, rosin, cleaning cloths, flashcards, music books, etc. ), we can also assist with replacing strings and basic instrument repair or send instruments out for more complex repairs. Please call or visit us for more details or assistance.